Entertainment TV show “Kang’s Kitchen” has closed up the show’s titular restaurant, leaving only the director’s cut to air Tuesday. The six-episode show aired on tvN was a spinoff of the reality TV show “New Journey to the West,” produced by megahit producer Na Young-seok. Original cast members of “New Journey to the West” -- Kang Ho-dong, Lee Su-geun, Eun Ji-won, Mino and Ahn Jae-hyun -- starred in the show, excluding only Kyuhyun, who had recently enlisted in the Army. The team ran a small restaurant dubbed Kang’s Kitchen on Jeju Island for five days in November, serving pork cutlets, fried rice, kimbap and ramen. They did everything from buying the groceries to serving the food. Viewers of the show were intrigued by the fact that none of the stars were familiar with cooking, nor had they run a restaurant before. Kang’s Kitchen closed up shop with a net profit of 101,500 won ($95), excluding the salaries of the cast and rent. Apart from the dismal profits, the restaurant was a success with customers standing in long lines and waiting for hours. Satisfied with the food and great service, visitors praised and thanked the stars. The menu items, created from unique recipes, grabbed the attention of viewers as well. Numerous photos of people making the food introduced in the show have been posted via social media. Another takeaway from the show was the teamwork between the staff and the cast. Already familiar with each other from past shows, they freely made suggestions to one another. The main producer even worked in the kitchen for a day, washing the dishes. “Kang’s Kitchen” recorded an average rating of 8.3 percent, with its peak at 9.1 percent. The numbers are considered high as the show aired late at night on a cable channel on Tuesdays. The original show, “New Journey to the West,” started out as a web entertainment program in 2015. Well received on the internet, the show then moved on to television where it was turned into a multiseason program. In the episode that aired Jan. 2, comedian Lee joked they might as well as run a car wash. Many are taking the comment as a hint for the next spinoff, as that was also how “Kang’s Kitchen” got its start. 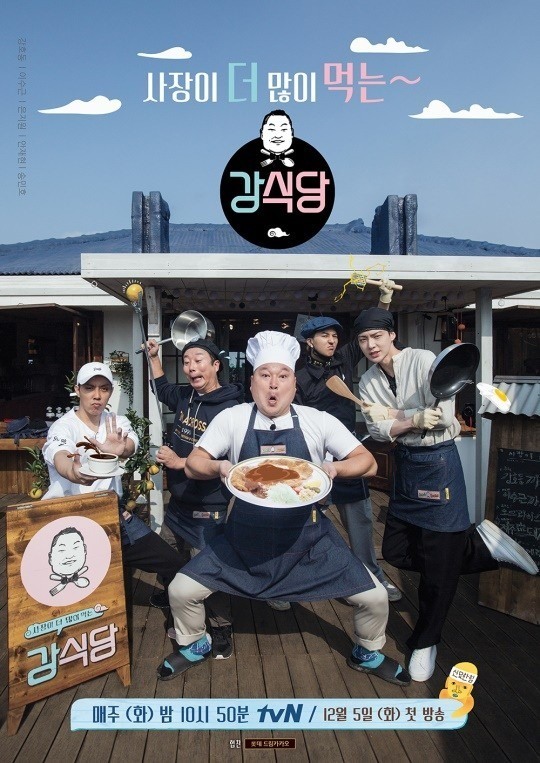 “Kang‘s Kitchen” was produced after Song made a wish in the fourth season of “New Journey to the West.” He suggested the cast run a restaurant under the name Kang’s Kitchen, as another show by producer Na, “Yoon’s Kitchen” had proved a major hit. Regardless of how it began, “Kang’s Kitchen” became a TV sensation, showing the crew from “New Journey to the West” could do much more. A director’s cut of the show will air Tuesday, showing how the cast spent the last night on Jeju Island after closing down the restaurant.